1. Do toys promote unhealthy eating? 2. Should fast food restaurants be banned from giving away toys with children's meals? 3. Is this yet another example of the nanny state intruding into people's lives? 4. Who is responsible for what children eat? The government or parents? These ads made me laugh. This cartoon by Peter Brookes from The Times mixes last night's televised election debate with Gordon Brown's 'bigot' gaffe (see recent posts), and the news that John Lennon's handwritten lyrics to A Day in the Life, one of the Beatles’ most celebrated songs, are to be sold at Sotheby’s in New York in June. Conservative leader David Cameron and Lib Dem leader Nick Clegg are singing The Beatles' song, while Prime Minister Gordon Brown holds his head in his hands (in despair?). John Lennon's lyrics have been altered slightly to fit the circumstances. The original words are, "He blew his mind out in a car. He didn't notice that the lights had changed." And as every Beatles fan will know, the four thousand holes were in Blackburn, not Rochdale. 1. If you blow your chances, you make a mistake which wastes the chance (e.g., of winning the election) or causes the attempt to fail. 2. Mic (pronounced 'mike') is short for microphone. The Telegraph headline features a play on words. If you are on the money, you are right about something. And one of the main subjects of the debate was economic policy. • The Star's editorial was elegant, articulate and right on the money. Here is the CNN Student News for Friday 20 April. Click on the links to see a transcript. The Australian government has announced what it claims are the world's toughest anti-smoking measures. From 2012 all cigarettes will be sold in plain packets with no company logos, large health warnings, and the brand in small print. Ian Woods reports. Oz is an informal way of referring to Australia. Most of the editorial cartoons in today's UK national dailies refer to Gordon Brown's disastrous 'bigot' gaffe (read full account here). 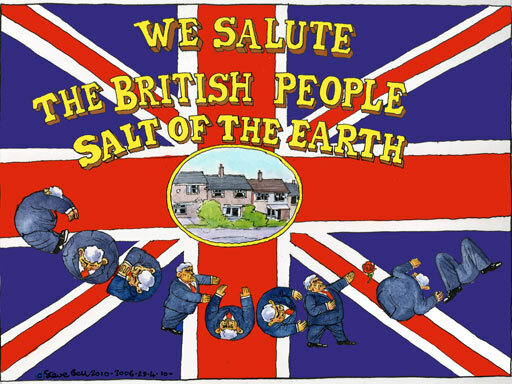 This rather graphic one by Dave Brown (no relation) from The Independent shows the UK PM shooting himself in the foot with his mouth, which is shaped like a gun. The tears pouring from his eyes could be tears of pain, tears for the end of his election hopes, or crocodile tears over what he said about Mrs Duffy (his grovelling 'apology' has to be the most cringe-making event of the election campaign so far). The cartoon is a visual representation of a well-known metaphor. If you shoot yourself in the foot, you to do or say something stupid which causes problems for you. Garland has a similar cartoon in The Daily Telegraph, which uses another foot metaphor. If you put your foot in your mouth, you say something embarassing. Gordon Brown has personally visited grandmother Gillian Duffy to say sorry for calling her "bigoted" behind her back after a discussion on immigration, as Sky News' Niall Paterson reports. 1. If you accuse someone of being a hypocrite (pronounced 'hippa-crit'), you mean that they pretend to have qualities, beliefs, or feelings that they do not really have. • Alex Salmond has been ­branded a hypocrite after launching a scathing attack on the “extraordinary” decline of Westminster politics while facing accusations he is cashing in on his own departure from the House of Commons. 2. Someone who is bigoted has strong, unreasonable prejudices or opinions and will not change them, even when they are proved to be wrong. • British Prime Minister Gordon Brown was caught on tape describing a voter as "a bigoted woman" on Wednesday after she confronted him on immigration. Here is the CNN Student News for Thursday 29 April. Click on the links to see a transcript. 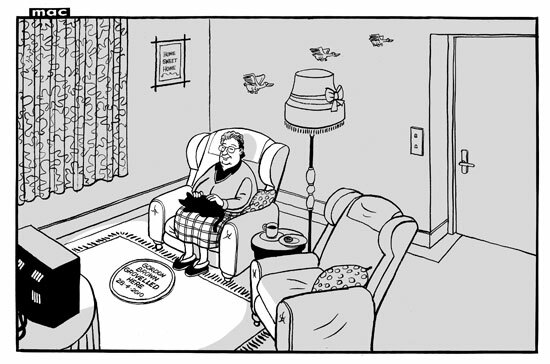 Today's cartoon by Mac from the Daily Mail relates to the Tories promise to get tough on school discipline. 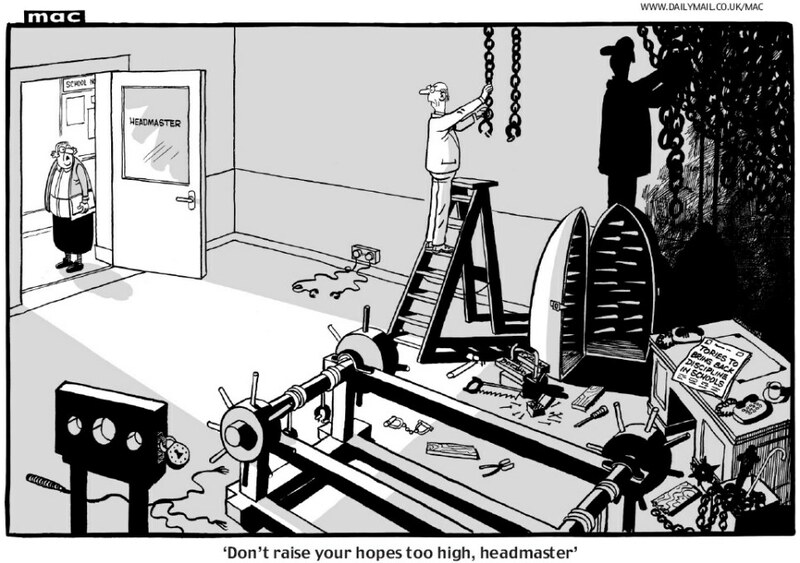 A headmaster is constructing a torture chamber in his office. A newspaper on his desk has the headline "Tories to bring back discipline in schools". His secretary sees what he is doing and comments, "Don't raise your hopes too high, headmaster". 1. If you warn someone not to raise their hopes too high, you are warning them that they should not become too confident of progress or success. A similar expression is to get (or build) one's hopes up. 2. A headmaster is a man who is the head teacher of a school (usually in Britain). The female equivalent is headmistress. Current and former Goldman Sachs executives appear before US Senators in a lawsuit against the firm by the American government and, as US correspondent Greg Milam says, the senators do little to conceal their frustration at the answers they receive. Fabrice Tourre (aka Fabulous Fab) is French. You could probably tell by his accent. He also gets the stress wrong on 'alleging'. Good subject for class discussion: Should we try to stop trying to contact alien life forms?